I can't tell you how many times I've heard this sentence in the past year during conversations about traveling in the US. And it's fair – I've been to 30 out of 50 states so far. I've been to big, famous cities like New York and Las Vegas and San Francisco and Chicago. I've even cited some southern locales (ahem, Savannah) as some of my favorite places to visit in America. But, up until a couple weeks ago, there had been a glaring omission: New Orleans. So, when my friend Kasey told me about a conference she was going to in New Orleans and that she was considering heading down a few days early to see the city and celebrate her 30th birthday, I of course selflessly volunteered to go with her. It ended up being the perfect introductory trip to New Orleans. Even though we were celebrating a birthday, both Kasey and I prefer to gorge ourselves on food instead of alcohol. And so, while we did spend a bit of time in the French Quarter, we barely set foot on the famous Bourbon Street. So I figured I would highlight some of the things to do in New Orleans that have nothing to do with beads and beers on Bourbon Street. New Orleans' French Quarter is the city's most famous neighborhood – and it's also the oldest part of the city. This is where the first French colonists settled in the early 1700s, bringing with them culture and architecture that you can still see there today. Wandering around the French Quarter is a must. Jackson Square – This square near the river is one of the oldest in New Orleans. And the iconic St. Louis Cathedral on one end of the square is the oldest continuously active Roman Catholic Cathedral in the United States (having originally been built in 1724). This is a great spot to buy artwork and souvenirs, watch buskers perform, and start a carriage tour of the city. 1850 House – On the opposite side of Jackson Square, you'll find the 1850 House. This multi-storied home is decorated with period furniture and artwork in order to depict middle class family life during New Orleans' most prosperous years. The Cabildo – Located near St. Louis Cathedral on Jackson Square, the Cabildo is one of New Orleans' most important historical buildings. Not only has it served as the seat of the city's government in the past, but it's also where the Louisiana Purchase was signed in 1803. Today it's a museum, with artifacts and exhibits that showcase the history of New Orleans and Louisiana. Historic French Market – You'll also want to check out the French Market, which spans roughly 6 blocks in the quarter. Not only is this a great place to shop, but you'll find very affordable eats here, too. New Orleans is famous for its Mardi Gras celebrations each spring, but visiting during that time of year can be a bit overwhelming. But guess what? You don't *have* to visit near Fat Tuesday in order to experience Mardi Gras in New Orleans! I wasn't sure what to expect from Mardi Gras World, but it turned out to be one of my favorite things in New Orleans. The warehouse facility near the city's cruise port is where many of the famous Mardi Gras floats are conceptualized and built each year, and it's also where tons of props are stored. The detail on these floats/props is incredible! Your ticket (which is roughly $20 per adult) includes a short movie about Mardi Gras, a guided tour of the facility, and then free time to roam around all the floats and props. It's super interesting to learn about the different krewes, how the floats are designed each year, and what riding on a float is really like. Many people never leave the French Quarter when they visit New Orleans, but I highly recommend seeing some of the city's other neighborhoods, too. My other favorite is probably the Garden District. It actually used to be called the “American District” because it's where all the Americans who came down after the Revolutionary War settled in New Orleans. The architecture here is so different from what you'll find in the French Quarter, and the tree-lined streets are much quieter. 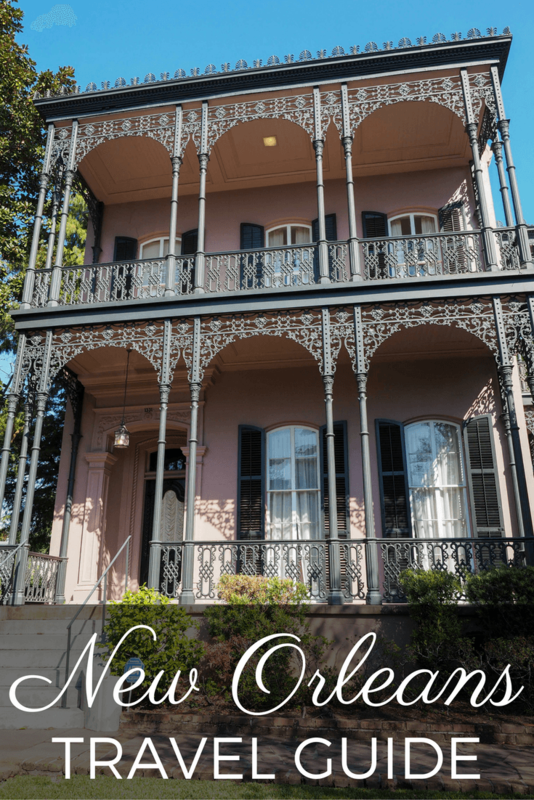 Kasey and I booked a walking tour of the Garden District with , which was a great way to learn the history of the neighborhood and see some of the most famous homes. We also took a stroll along Magazine Street, but unfortunately most of the cute little shops close at 5 p.m.! If it's true green space you're looking for, New Orleans has some great parks to enjoy. Kasey and I spent a morning at City Park, enjoying all the huge live oaks and wandering through the sculpture garden at the New Orleans Museum of Art, and then spent an afternoon at Audubon Park in the city's Uptown neighborhood. How amazing is this tree in City Park?? Both parks have nice walking/biking trails and tons of huge trees. Wandering through Audubon Park especially gave us a feeling of what it might be like to actually live in New Orleans as opposed to just being tourists there. Maybe it's weird, but I love visiting cemeteries when I travel. And New Orleans has some very famous and fascinating cemeteries. We visited Lafayette Cemetery No. 1 as part of our Garden District walking tour, and learned all about these “Cities of the Dead” in New Orleans. When you die in New Orleans, your coffin is put in your family mausoleum for at least one year and one day. After that, the family removes the coffin, places the remains in a bag, and puts them back into the bottom of the mausoleum, making room for more dead. This means that there literally could be dozens – or even hundreds! – of bodies in just one crypt. Talk about efficient (and creepy). If you have time, definitely try out a in NOLA. Speaking of creepy… You can't really go to New Orleans without going on a spooky tour of some sort! Since Kasey and I were interested in everything from ghosts to voodoo to vampires, we ended up booking the of the French Quarter with Haunted History Tours. The 2-hour evening walking tour was very well-done – it was the perfect blend of actual history and spooky mystery from New Orleans over the centuries. New Orleans is incredibly famous for its jazz music. And while you can find it on Bourbon Street, the best “local” place to go for live music is Frenchmen Street in Faubourg Marigny. Within the space of about 4 blocks, you'll find some of the best live-music venues in the city here. Perhaps just as famous as its music is New Orleans' food. I don't pretend to be a foodie by any means, but OH. MY. GOD. The food in New Orleans is just incredible. I left Kasey in charge of most of our restaurant choices, but I don't think it would have mattered – everything we had was delicious (and I'm pretty sure I gained like 10 pounds in 4 days). Pre-dinner drinks at the Carousel Bar (inside the ) – the bar slowly spins like a carousel! I wish I could have stayed another week just to eat all the delicious food! Lastly, if you have an extra day in New Orleans, I highly recommend getting out of the city to see one or two of the nearby former plantations. These plantations (and everything associated with them – including slavery) were such a huge part of southern Louisiana's history. Since we didn't have a car, Kasey and I booked a . We visited Laura and Oak Alley plantations, both roughly an hour from downtown New Orleans. Laura Plantation is a historic Creole Plantation, and I really enjoyed the tour of the house and grounds here. They're doing a lot to restore buildings on the property in order to tell the story of everyone involved in the plantation's story – including the former slaves. Oak Alley is possibly the most photogenic of the Old River Road plantations because of the avenue of 28 live oaks that lead up to the plantation house. It's more commercialized than Laura (with a restaurant, B&B, and even a bar on the property), but the tour through the house was interesting and they have a decent exhibit on slavery at the plantation in replicas of old slave cabins. There's SO MUCH to do in New Orleans without ever setting foot on Bourbon Street. In fact, with four full days in the city, there was still plenty we didn't see (and even more that we didn't eat!). Next time, I'd spend more time in the Bywater and Faubourg Marigny neighborhoods. I might take a . I would probably take another ghost or vampire tour. I would consider a . And I would try to get to Whitney Plantation. Whatever you do, don't think that there's nothing more to NOLA than partying on Bourbon Street! The most popular time to visit NOLA is February-May, when the weather is mild and you have events like Mardi Gras and the annual Jazz Fest happening. BUT, visiting in mid-November was great, too. We had mostly sunny weather, no humidity, and temperatures near 70 degrees (F) every day. And, with no huge events going on, it never felt like it was too crowded, even in the French Quarter. Kasey and I rented an awesome shotgun-style home in the hipster Bywater neighborhood, which was great for our budget and for getting a more “local” feel for New Orleans. But if you want to be closer to the action, I would probably just book something in the French Quarter. For luxury-seekers who still want the historical charm, my pick would be the . For those looking for something more budget-friendly, check out the . In the Garden District, I would go boutique: the and would be my picks. Uber – Kasey and I are both Uber fans, and the ride-sharing company is alive and well in New Orleans. Since we were staying about 3 miles from the French Quarter (and most of the other places we wanted to visit), we would usually get an Uber into and back home from the city every day. Rides were usually under $10. By foot – Lastly, we walked a ton in New Orleans! Most neighborhoods (and especially the touristy ones) are perfectly safe to walk through, and it's a great way to see all the interesting and colorful architecture. To be perfectly honest, NOLA is not a super expensive place to visit. Accommodation is reasonable for a larger city, food is extremely affordable, and you can find a lot to do for not a lot of money. If you want to search for deals, though, for New Orleans-specific deals before you leave home. What would YOU most want to do in New Orleans? I love New Orleans. I was there a few years ago, and while I checked out Bourbon Street it wasn’t my favourite part about New Orleans. I loved wandering around the city and hearing music everywhere. Whenever I go back I want to visit Mardi Gras world and take some tours of the plantations, which I didn’t get to do. And eat, eat lots of delicious food. Ahhhh the food. 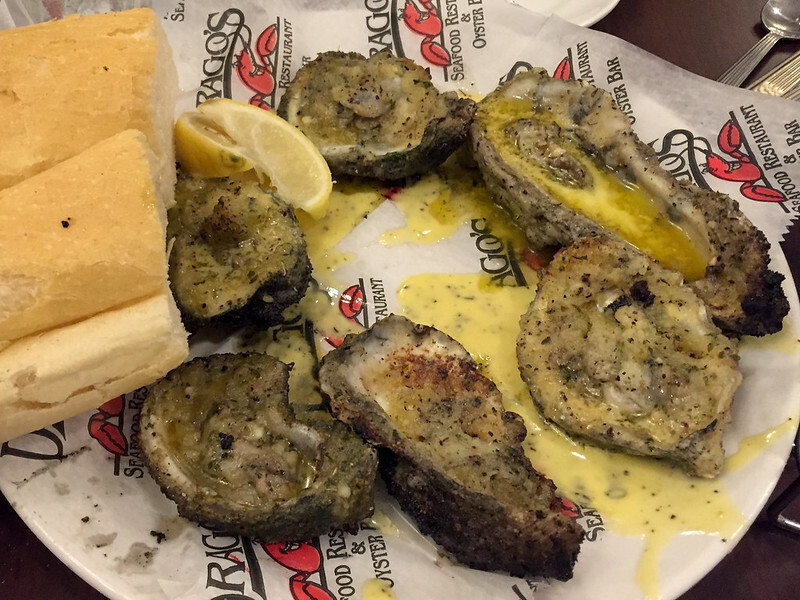 I wished I had an extra stomach in New Orleans – and that’s something I hardly ever say! Thank you! I haven’t done much research on New Orleans as I usually travel solo and didn’t have any idea what I’d do if I’d go. Now I realize I need to do more research as all these things sound right up my alley! It really is such a cool city, and there’s a lot more to do and see than I think most people realize if all they think of when they hear New Orleans is Mardi Gras and Bourbon Street! This is perfect! I’ve been dying to visit New Orleans, but since I’m not a drinker, I wasn’t sure how great of a destination it would really be for me. Now, it looks like I’ll still have a good time, and eat ALL the beignets! I LOVED Mardi Gras World, it was definitely a highlight for me. Next time I visit I’d love to see Oak Alley – that photo is amazing! I was worried I wasn’t going to get that Oak Alley photo because they were burning sugarcane fields nearby and there was so much smoke around. But I ended up getting it! And yes – Mardi Gras world was so awesome! It’s definitely made it onto my list of favorite US cities! 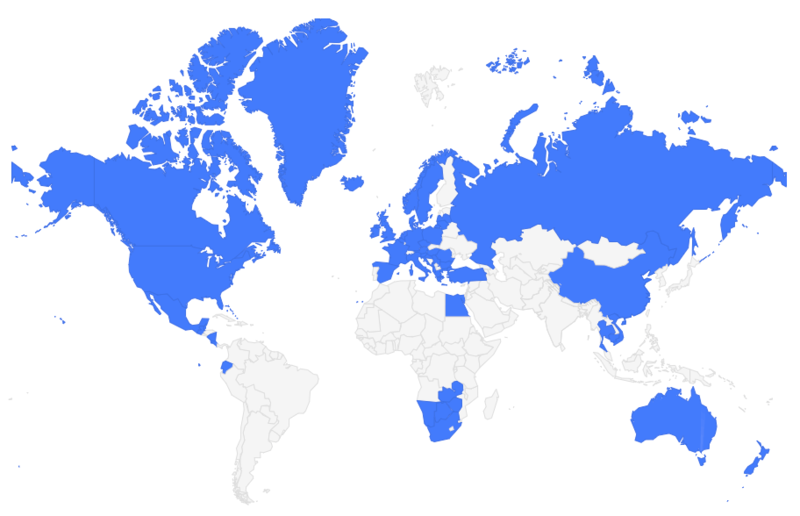 I would like to visit the southern states of the USA. I would probably do exactly the same as you, in particular the cemetery (when I hear about special cemeteries on a trip you can usually find me there) and the ghost tour! I would also like to the river boat tour! The South and Southwest are both so different – but two fantastic parts of the US to explore! My sister and I made a pit stop in New Orleans back in May. We only had time to explore the French Quarter for a few hours, but seeing the architecture in person was amazing. (And so were the beignets!) I’d love to go back for longer sometime so I can explore the rest of the city. As for Bourbon Street, well, I did take a picture of the street sign before bolting to the fresher air of the rest of the Quarter. Not really my cup of tea, so this list is great! I really want to see the Garden District and the cemeteries next time. I was there for four days and still felt like I barely saw anything! At least you go to see some of the beautiful French Quarter architecture, though! Loved the post – pictures were fantastic – what is the best way to get from the airport into town – is there a shuttle service? Did you use Uber for this? Ah yes, someone else said that museum was great! It’s definitely something I would want to check out next time! I really like this post Akatuki! I haven’t been to this part of the US, but I like the history and the mystical fascination with witchcraft and magic! I’m watching “The Originals” a gothic vampire series on Netflix at the moment, which is mostly based in the French Quarter of New Orleans. I was also introduced to “American Horror Story” when the location was based in New Orleans too, as I like productions with historical context lol! I do like my TV horror productions. Eeek! And you can find nods to all of that and more in New Orleans thanks to its long history in the US! Awesome list, you really can’t deny beautiful place like New Orleans. Thanks for sharing. Nope, it would be pretty difficult to argue against the beauty of New Orleans, especially when talking about the French Quarter and Garden District! Great writeup, Akatuki. I freaking love NOLA. Some other great things to do are swamp kayaking in the bayous with a local outfitter. Also, Lafitte’s is the oldest bar in America with quite a dodgy history. I want to go back for a glass of Abita Amber. Oh, and the hand cartons of boxed wine. Keep it classy! I think doing a bayou/swamp tour would definitely be on my “next time” list! So many good information and details with awesome pictures. Seems like a very good travel guide for New Orleans. Thank you! Thanks, Serhat! Hopefully it’s inspired you to want to visit New Orleans! I am one of those people Akatuki that would be shouting “Visit New Orleans!” and tell everyone it’s my favorite city in the world. One I’ve never really covered though, maybe I need to revisit it! I loved the French Quarter, and the food made me weep it was so good. Actually one meal did truly bring tears to my eyes haha. And the vibrance of the people. So good. It’s such a cool city, and I’m so happy I finally went! And the food… OMG THE FOOD! I love New Orleans SO much! I went years ago (gosh – over a decade at this point, I guess!) and it’s *still* one of my favorite cities in the world. I was so young back then – I definitely need to revisit and try again as an adult! My boyfriend and I at the time had gotten some “great deal” and got stuck in some hotel that said it was in New Orleans but was actually in another city a half hour away. We weren’t old enough to affordably rent a car at that time, so we spent a lot of time (and money) cabbing it back-and-forth every day. I definitely need a do-over! (And with all that, it’s STILL one of my favorite cities!) Your post brought back so many great memories. Glad to see you enjoyed your time there! Awesome! I think once you get there you realize just how much there is to see/do, but if you’ve never been you have no idea!